[Dr. Detering writes, p.3:] Further interpretations of the Exodus motif are found with the Peratae and the Naassenes. The two Gnostic sects—together with the Sethians—make up the so-called Ophites, described by Hippolytus in the fifth book of his Refutations. The name derives from the Greek word for serpent, ophis, based on the fact that the serpent plays a central role in the mythology of all three sects…  For them, the serpent in the Garden of Eden brought gnosis. It was also a symbol of healing and salvation. For the Peratae, the creation is the realm of nothingness and transience. Because all is subject to these characteristics, for the Peratae there is only one way to salvation: man must negotiate his demise—which he cannot avoid—even before physical death. 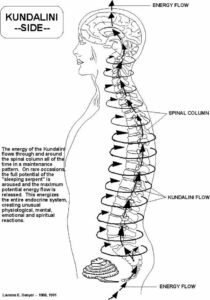 The serpent, Enki, and Kundalini. Due to their veneration of the serpent, the Peratae were denominated among the “Ophites” by Hippolytus. We have already briefly discussed the serpent-worship in Stone Age times (here). Veneration of the serpent continued into the Bronze Age and even later—that is, it was an important component of the religion of the earliest civilizations. It is important to note that this veneration was based on the serpent as messenger of gnosis from the transcendent realm (originally conceived as below the earth). 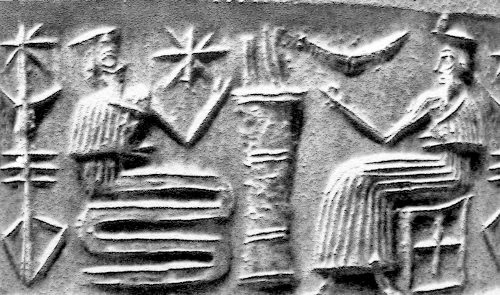 The Mesopotamian god Enki as half-man half-serpent is at left. The waxing crescent moon (center right) was also an ancient symbol of gnosis, representing the conquest of light over darkness. In early civilizations, the serpent was venerated as wise—and also wily. Enki, the clever Mesopotamian god of wisdom, was usually depicted seated upon a (coiled) serpent throne. Alternatively, he was half-man, half-serpent. Given that water (in addition to the serpent) was also a symbol of gnosis, it is no surprise that Enki’s mythical home was the underworld ocean, known as the Abzu. You [gods] who were born from waters… listen to my call… Looking on men, never slumbering… Borne on refulgent chariots, sinless, with serpents’ powers…” [Rigveda 10.63:2-4]. You [gods] who were born from gnosis… listen to my call… Looking on men, never slumbering… Borne on refulgent chariots, sinless, with unsurpassable wisdom…” [RV 10.63:2-4, edited]. Buddhism, emptiness, and transience. Buddhism teaches three enduring characteristics of existence (ti-lakkhana): transience, emptiness, and dissatisfaction. Each of these characteristics has received volumes of commentary over the centuries, and I won’t enter into detail here. Suffice it to note that the second characteristic, emptiness (suññatâ) is associated with (and sometimes synonymous with) the doctrine of non-soul or not-self (anattâ)—the single element that made Buddhism largely unacceptable and a ‘heterodoxy’ in South Asia. “Now, suppose one were to say, ‘I will walk until I reach the end of the world.’ Brethren, were one to live even a hundred years and walk for a hundred years, one would die before reaching the end of the world. Why? Because the end of the world is not reached, not seen, not known, through such journeying. Once again, this reminds us of the Peratae. As Dr. Detering states: “[F]or the Peratae there is only one way to salvation: man must negotiate his demise—which he cannot avoid—even before physical death.” This is realized eschatology—and it is an original Buddhist tenet.